INA – Bradley Phillips has something to prove. Simply put, Phillips wants to prove he’s fast. But, there is so much more to it than that. A high school track sprinter at Benton Consolidated High School, Phillips was a member of both the 4×100 and 4×400 meter relay teams that smoked the previous school records. “The 4×4 relay, we broke the record at state. We qualified at sectionals by running a 3:26. At state, we were seeded second. At state we ran a 3:22.85, and I believe that broke the school record by just under two seconds,” Phillips explained. In spite of his success, Phillips received no offers to run at the college level. It was something that shook his belief in himself. But, this is a young man who is no stranger to adversity. When he was eight, he was riding his bike when he hit a hole in his yard. The handlebar struck Phillips in the rib, breaking it and sending the bone though his lung and into his liver. He had internal bleeding and a collapsed lung. He survived the encounter and overcame a number of personal issues to find success. He wasn’t about to let this newest development derail him. So, with track out of the question, he changed gears and set his sights on his degree. It came as a shock when almost a year later he received a letter for SIU saying that he owed the college thousands of dollars for classes he never attended. Luckily, Phillips had someone in his corner. Actually, a group of someones, the RLC STARS Program, a group of dedicated individuals devoted to student support. RLC’s STARS Program is a Student Support Services grant, funded by the U.S. Department of Education as a component of TRIO. It is designed to help eligible Rend Lake College students make the most of their college years by offering the advisement and academic support that may be needed to successfully complete a college degree and transfer to a four-year university. The STARS Program assists 160 Rend Lake College students each year. “It took a lot of paperwork to prove I wasn’t there. I had to get my work stubs. There was a petition that I had to fill out. Leah [Stallman, TRIO Director] helped me navigate the whole thing. Without that help, I’m not sure what would have happened. 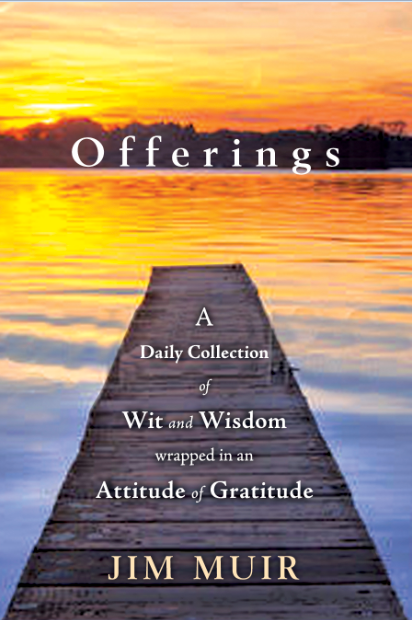 That almost stopped me from going to college,” Phillips expressed. Phillips credits STARS with being one of the reasons he is even still at college. Everything from transportation issues to food to a friendly ear, he says they are more than just college employees. He calls them his family. With his academic life sorted back out, Phillips couldn’t shake his other passion, improving in the gym. But, without a track program at RLC, the runner began focusing on building muscle. “I was just a typical gym dude,” he said with a shrug. “I spent a lot of time in the gym. Again, someone stepped up to help him get back on track. Coach Aron Kays, his former assistant track coach at BCHS, contacted Phillips and encouraged him to start running again and compete independently. “At that point, he had more faith in me than I had faith in myself,” Philips said. So, at his coach’s urging, Phillips took to the track again. In his first meet back, he put up a time comparable with any of his races during his senior year. He hadn’t lost a step. Little did Phillips know at the time, but his decision to start competing again would change his life. During a competition at Illinois College in Jacksonville, Ill., Phillips raced against Missouri Baptist University (MOBAP) standout and RLC alum Robert Grinder. All Phillips was hoping for was to compete with Grinder. He ended up leading some of the race and earning the attention of his competitor. Phillips hit it off with the coaching staff at MOBAP and started communicating with the team. 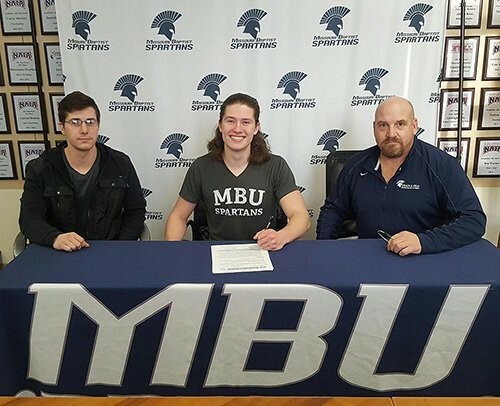 All the hard work culminated last month when Phillips singed his letter of intent to run for Missouri Baptist starting in the fall, complete with an academic scholarship. “This scholarship is a big deal,” he said grinning. “I know I wasn’t born with athletic talent. I’ve had to really work hard to get where I am. I have been extremely lucky to have some fantastic people around me. Without people like Coach Kays or STARS, I wouldn’t have gotten here either. So, I want to win every time I complete. I want to represent this area and the people who put their faith in me,” he expressed. Originally, Phillips wanted to study Physical Therapy. His obsession with improving athletically led him to put a lot of time and effort into studying what would help make him a better runner. But, during his time at RLC, he switched goals. Now, he’s hoping to become a math teacher. Phillips enjoys mathematics. While running doesn’t come easy for him, numbers do. Plus, his entire life has been shaped and molded by the teachers who were there for him while he was growing up. Phillips will graduate with his RLC degree in a few short weeks thanks in no small part to the STARS team and the generosity of Rend Lake College Foundation donors who provided one of the academic scholarships that Phillips was able to earn during his time in Ina. So here, at the starting line of the next big chapter in his life, Phillips knows what he’s running for. Now, it’s more than just competing. It’s proving the trials and tribulations didn’t slow him down. It’s proving that he believes in himself as much as those around him do. It’s proving that he can be more than fast. It’s about proving he can be the best, both on and off the track. 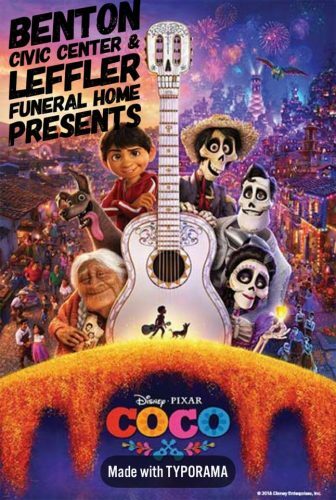 BENTON The Benton Civic Center and Leffler Funeral Home presents Disney’s COCO- free family movie night, March 31 at 6:00 PM!!! Kids are welcome to bring a blanket and relax on the carpet. Tables and chairs will be provided for the parents. Pizza, popcorn and soda will be available for purchase. We hope to see you there!!! 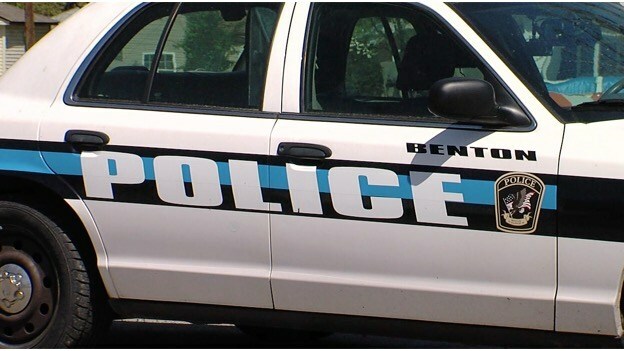 BENTON – Thursday, Feb. 22, at 2:03 p.m. the Benton Fire Department received notice of an adult male who was climbing atop a cell-tower near a local health clinic. Benton Fire Chief Shane Cockrum said dispatch received the call from employees at the clinic, noting that an employee noticed someone had climbed up and over the barbwire fence. 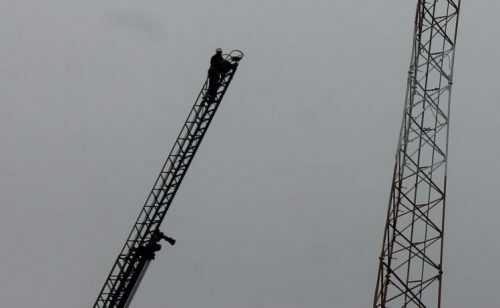 At the time the Benton Police Department arrived on the scene, the individual had made it halfway up the estimated 140-foot tower and had indicated his intent was to take his own life. Benton’s 805 ladder truck is 105-feet tall, Cockrum said, which left the Fire Chief approximately 30-35 feet below the man he was attempting to save. Cockrum ascended the ladder and began a nearly three hour life-saving conversation. If you or someone you know is struggling with suicidal thoughts or depression, please call the National Suicide Hotline at 1-800-273-8255. 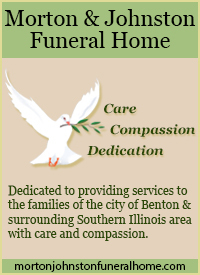 Please click on the link below from William McPherson of the Benton Gazette. 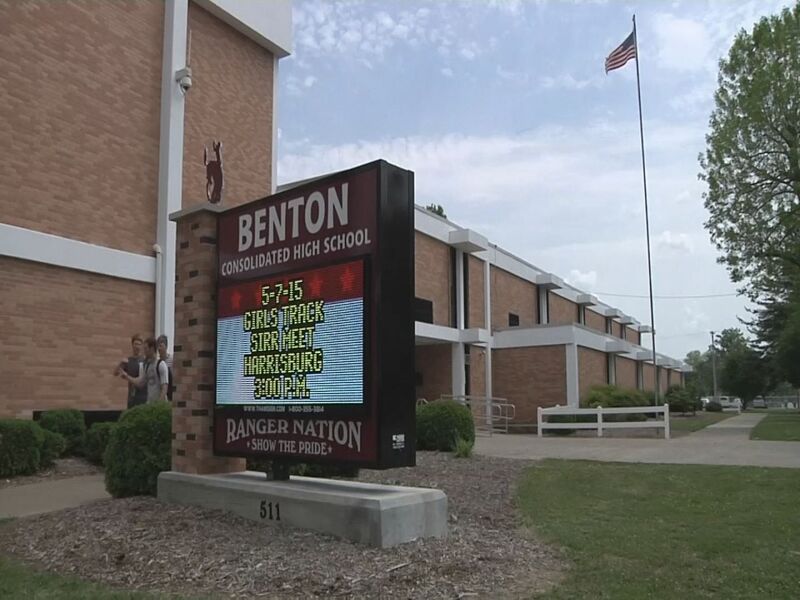 CARBONDALE – The Benton Rangers start the road to Peoria tonight as they face the Marion Wildcats at the Carbondale Class 3A regional. Game time is 7:30 p.m.
For Benton Coach Ron Winemiller, he will be coaching against a long time mentor tonight, in Marion coach Gus Gillespe. It is Gillespe’s first year at Marion after being at Marshall County KY, for two decades. 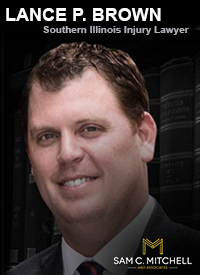 Winemiller was a long time assistant at Marshall County before taking the Benton job nearly a decade ago. This is what Coach Gilespie had to say about facing coach Winemiller tonight. 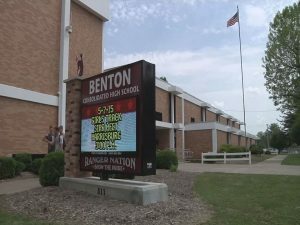 “Benton is a great team and has one of the best records in southern Illinois- my family considers Coach Winemiller to be part of ours- he has done a awesome job at Benton I am very proud of him. Even though all five that will take the floor for Benton can flat out stroke the three the best shooter on the floor will be Justin Saddoris. He is one of the purest shooters than I have watched in years. At the Midwinter Classic, coach Gillespe dressed 10 or 11 and played them all. 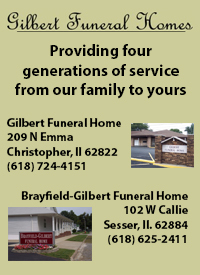 Along with Connor, there will be one or two post players on the floor to go with him, around 6 4″ or 6′ 5″ One of them is Cole Schafer, son of former Benton and later SIU standout, Jay Schafer. Even though the Rangers were out sized a lot going into the 3A post season last year, I can not help but think how the undersized Rangers held their own in the paint. They did what is fastly becoming a lost art in HS basketball, they boxed out. Parker Williams more than held his own in the paint against some stiff competition in the post season. I don’t expect anything less tonight. Neither team lights up the scoreboard. I look for the final to be in the 30’s or 40’s. I don’t think you can pick a clear cut favorite in this one. I expect it to be a dandy of a high school basketball game. 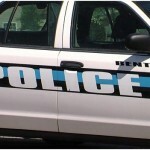 BENTON – During the Public Affairs Report at the Feb. 12 Benton City Council meeting, Mayor Kondritz said that Benton’s water department and infrastructure had been under a lot of stress due to recent weather and the aging of the city’s water and sewer lines. “I saw where President Trump introduced a $1.5 trillion (budget) bill, and I don’t care what you think about that situation. What I care about is that as the City of Benton, I want our slice of the federal pie,” Kondritz said. BENTON – On February 13th, 2018 Benton Police arrested Patrick S. McClerren, age 42, of Benton on active warrants for both Franklin and Williamson counties for failure to appear. McClerren was also charged with unlawful possession of methamphetamine and unlawful possession of drug paraphernalia. Through further investigation, police also arrested two other individuals identified as Angela Patterson, age 40, and Samantha Thebeau, age 26, both of Benton for unlawful possession of methamphetamine and unlawful possession of drug paraphernalia. McClerren, Patterson, and Thebeau were all charged and transported to the Franklin County Jail for further processing. On February 16th, 2018 Benton Police arrested Roy D. Stinson, age 42, of Benton on an active Franklin County warrant for failure to appear. Stinson was transported to the Franklin County Jail for further processing. The public is reminded the alleged are presumed innocent until proven guilty in a court of law.